Panathinaikos Football Club (Greek: ΠΑΕ Παναθηναϊκός Α.Ο. [panaθinaiˈkos] ( listen)), known as Panathinaikos, or by its full name, and the name of its parent sports club, Panathinaikos A.O. or PAO (Παναθηναϊκός Αθλη��ικός Όμιλος; Panathinaïkós Athlitikós Ómilos, "All-Athenian Athletic Club"), is a Greek professional football club based in the capital-city of Athens. The name "Panathinaikos" was inspired by the ancient work of Isocrates, Panathenaicus, where the orator praises the Athenians for their democratic education and their military superiority, used for the benefit of all Greeks. Today a part of Panathinaikos A.O., they are the oldest active football club in Greece, initially founded only to practice this sport. Created in 1908 as "Podosfairikos Omilos Athinon" (Football Club of Athens) by Georgios Kalafatis, they play in the Super League Greece, being one of the most successful clubs in Greek football and one of three clubs which have never been relegated from the top division. Amongst their major titles are 20 Greek Championships, 18 Greek Cups, achieving eight times the Double, and 3 Greek Super Cups. They are also the only club that won a championship undefeated, going without a loss in a top-flight campaign (1963–64 season), a feat that no other club in Greece has ever been able to achieve. Panathinaikos is also the most successful Greek club in terms of achievements in the European competitions. It is the only Greek team that has reached the European Cup (later renamed UEFA Champions League) final in 1971 (which they lost to Ajax Amsterdam 2–0), and also the semi-finals twice, in 1985 and 1996. It is also the only Greek team that has played for the Intercontinental Cup (1971). Furthermore, they have reached the quarter-finals of the Champions League on another two occasions (in 1992 and 2002), as well as the quarter-finals of the UEFA Cup twice (1988 and 2003). They have also won the Balkans Cup in 1977. Panathinaikos is a member of the European Club Association. Since the 1950s, the club maintains some of the oldest and most successful academies in Greece, producing talent for the first team and feeding the Greek national football team. Panathinaikos became professional and independent in 1979. They have played their home games in the Apostolos Nikolaidis Stadium, considered their traditional home ground, and the Athens Olympic Stadium. According to the most recent researches and polls, Panathinaikos is the second-most popular football team in Greece, with the percentage difference between Olympiacos and themselves varying between 2% to 9%. The club has million of fans inside Greece and millions of others in the Greek communities all over the world. They hold a long-term rivalry with Olympiacos, the clash between the two teams being referred to as the "Derby of the eternal enemies. 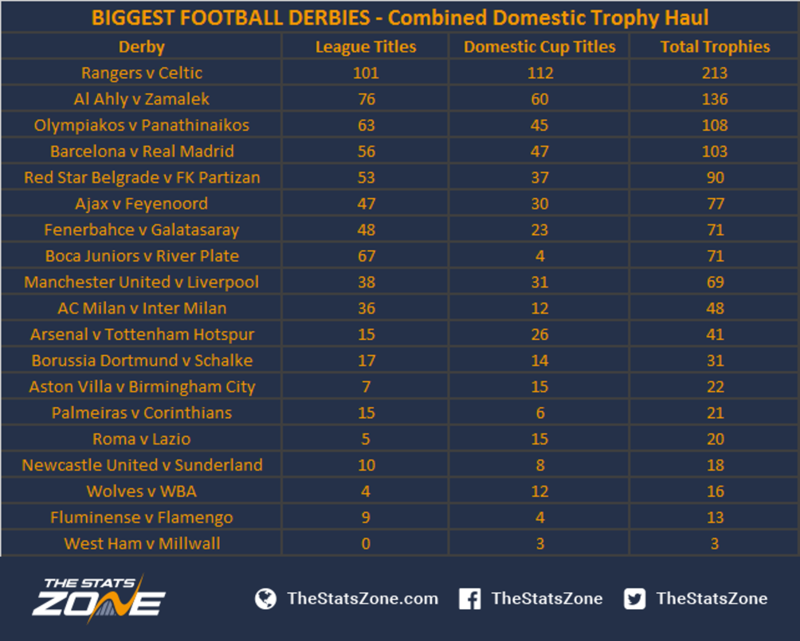 "The derby of the eternal enemies is traditionally included among the world's top 10 greatest football derbies, by the international media, compared with rivalries such as Boca Juniors-River Plate, Real Madrid-Barcelona, Rangers-Celtic, Galatasaray-Fenerbahce and Manchester United-Liverpool. According to the official history of the club, Panathinaikos was founded by Giorgos Kalafatis on 3 February 1908, when he and 40 other athletes decided to break away from Panellinios Gymnastikos Syllogos following the club's decision to discontinue its football team. The name of the new club was "Podosferikos Omilos Athinon" (Football Club of Athens). It was founded with the aim of spreading and making more known this new sport (football) to the Athenian and Greek public in general. Also, the intention of the founders was to create a team for all of Athens and to be connected with the rest of the European football movement, which was already active. The first president elected was Alexandros Kalafatis, brother of Giorgos. The ground of the team was in Patission Street. Oxford University athlete John Cyril Campbell was brought in as coach, the first time that a foreigner was appointed as the coach of a Greek team. Konstantinos Tsiklitiras, the great Greek athlete of the early 20th century, played as goalkeeper for the new team. In 1910, after a dispute among a number of board members, Kalafatis with most of the players—also followed by Campbell—decided to pull out of POA and secured a new ground in Amerikis Square. Subsequently, the name of the club changed to Panellinios Podosferikos Omilos ("Panhellenic Football Club") and its colours to green and white. By 1914, Campbell had returned to England but the club was already at the top of Greek football with players such as Michalis Papazoglou, Michalis Rokkos and Loukas Panourgias. In 1918, the team adopted the trifolium (shamrock) as its emblem, as proposed by Michalis Papazoglou. In 1921 and 1922, the Athens-Piraeus FCA organized the first two post-WWI championships, in both of which PPO was declared champion. By that stage, the club had outgrown both the grounds in Patission Street and Amerikis Square, due mainly to its expansion in other sports, and began to look at vacant land in the area of Perivola on Alexandras Avenue as its potential new ground. After long discussions with the Municipality of Athens, an agreement was finally reached and in 1922 Leoforos ("Avenue" in Greek) was granted to the club. The move to a permanent home ground also heralded another—final—name change to Panathinaikos Athlitikos Omilos (PAO), "All-Athenian Athletic Club", on 15 March 1924, from now on a multi-sport club. However, the decision was already taken by 1922. In 1926, the Hellenic Football Federation (HFF) was founded and the first Greek Championship under its authority took place in 1927. Panathinaikos won undefeated the Championship of 1929–30 under the guidance of József Künsztler and Angelos Messaris as the team's star player. Other notable players of this Belle Époque period of the team were Antonis Migiakis, Diomidis Symeonidis, Mimis Pierrakos and Stefanos Pierrakos, among others. They thrashed rivals Olympiacos 8–2, a result that still remains the biggest win either team has achieved against its rival, with Messaris scoring three goals. The team also defeated Aris 1–4 away in Thessaloniki. Messaris, who scored again three goals, became a hero and chant for the fans. In 1931, a serious disagreement between leading board member Apostolos Nikolaidis from one side, and some players (most notably Angelos Messaris) and club's officials on the other side, regarding the professionalization in the Greek football, which lasted two years, damaged the club and led to a counterproductive period. In the meantime, the HFF Greek Cup had commenced in 1932. The last bright moment for the Greens before World War II was winning the Cup for the first time in 1940 against Aris, 3–1. In 1940, with the break out of the Greco-Italian War, many players of the club joined the Hellenic Army. Mimis Pierrakos was killed during the war (later, during the 1950s, his bones were transferred from Albania back to Athens). During the Axis Occupation of Greece from 1941 to 1944, many players of the team became members of United Panhellenic Organization of Youth (PEAN) resistance organization., while Michalis Papazoglou had a leading role in the resistance group of Jerzy Iwanow-Szajnowicz. After this long crisis period, Panathinaikos had to wait until 1949 to win again a Greek Championship under the guidance of the Austrian coach Johann Strnad. That same year, Vangelis Panakis and Kostas Linoxilakis came to the club and quickly became the side's new star players. Panathinaikos was again champion for the 1952–53 Panhellenic Championship. Until 1959, the team had also won seven of the last eight Athens Championships, the regional championships organised in Greece. In 1959, Mimis Domazos, the emblematic captain of the team, made his first appearance with Panathinaikos and the same year took place the first season under the new system of Alpha Ethniki (1959–60 Alpha Ethniki). Panathinaikos was the champion team. During the next years, Panathinaikos were again champions in 1961, 1962, 1964, 1965, 1969 and 1970. Moreover, the team won two more Greek Cups, in 1967 and 1969. Also, during these years, a long process of rejuvenation took place in the club. Notable players retired, such as Panakis, Linoxilakis, Takis Loukanidis and Andreas Papaemmanouil, and the team had to count on young players like Domazos, Antonis Antoniadis, Anthimos Kapsis, Kostas Eleftherakis and Takis Ikonomopoulos. Stjepan Bobek was the main contributor to this process. In 1963, he became the club's head coach, changing the playing style of the team to a 4–3–3 and created a new team based on young players (the "Bobek's rejuvenation"). Under his guidance, Panathinaikos won the Championship of 1964 without a loss, making them the only team that has won the Greek Championship (with its modern system) undefeated. Notable players of the team included Panakis, Domazos, Takis Ikonomopoulos, Totis Filakouris, Frangiskos Sourpis and Aristidis Kamaras. With the establishment of the Greek military regime, the president of the club, Loukas Panourgias, was forced out of the presidency. The contract of Bobek was canceled by the State, while Apostolos Nikolaidis, the old player, manager and official of the club, went on trial. In 1967, the great Béla Guttmann came as coach, but he soon left and ex-player Lakis Petropoulos was appointed. Under his guidance, Panathinaikos won the championships of 1969 (with a double) and 1970. 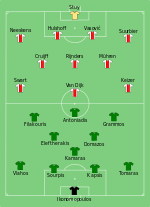 Line-up of the 1971 European Cup Final. In 1971, under the guidance of Ferenc Puskás, Panathinaikos were 1970–71 European Cup finalists, the first and only Greek team until today, losing 2–0 to Ajax at Wembley Stadium. In the road to the final, they eliminated Jeunesse Esch, Slovan Bratislava, Everton and Red Star Belgrade. Notable players included the captain Mimis Domazos, Anthimos Kapsis, Aristidis Kamaras, Kostas Eleftherakis, Totis Filakouris and the goalkeepers Takis Ikonomopoulos and Vasilis Konstantinou. Antonis Antoniadis was the top scorer in the competition scoring ten goals. In the same year, Panathinaikos played for the 1971 Intercontinental Cup (due to the refusal of Ajax to participate), where they lost to Uruguayan club Nacional (1–1 in Greece, 2–1 in Uruguay). Totis Filakouris was the scorer for the Greek club. During the last amateur years of Greek football, the Trifolium won one more Championship in 1972. Antonis Antoniadis was again top scorer with 39 goals (also second in Europe). His record remains until today in the Greek league. With the collapse of the military regime, Apostolos Nikolaidis became again active for the club and was appointed honorary president of Panathinaikos. In 1975, one of the greatest coaches of his era, the Brazilian Aymoré Moreira, who mainly worked in Brazil (World Cup Champion with the Brazilian national team in 1962), was appointed. After a year-and-a-half of poor results, however, he was replaced by Kazimierz Górski. With Górski, Panathinaikos won the double in 1977, followed by a Balkans Cup victory in the same year. Notable foreign players who played for the team during the late 1970s include Juan Ramón Verón, Araquem de Melo and Óscar Álvarez. Dimitris Saravakos (2009). Top scorer in the 1987–88 UEFA Cup, one of the best players in the club's history and the Greek football. In 1979, Greek football turned professional. The Vardinogiannis family purchased PAO's football department and Giorgos Vardinogiannis became president. Panathinaikos were one of the first Greek clubs that formed a women's team in 1980, but that department is currently inactive. The transformation period lasted a few years, but in 1982 the club won its first professional era trophy, the Greek Cup, and during the 1980s they would go on winning two championships (1984, 1986), four more Greek Cups (1984, 1986—with a 4–0 against Olympiacos in the final—, 1988, 1989) and the Greek Super Cup in 1988. The great star of the team during these years was Dimitris Saravakos, nicknamed "The Kid." Saravakos, a high-technique explosive miedfielder and iconic captain of Panathinaikos, was the alsolute idol for the fans during the 1980s, while other players included Nikos Sarganis, Spiros Livathinos, Velimir Zajec, Juan Ramón Rocha, Christos Dimopoulos and Giannis Kyrastas. In the 1984–85 season, Panathinaikos, with coach Jacek Gmoch and stars Dimitris Saravakos, Velimir Zajec, Juan Ramón Rocha and Ioannis Kyrastas, made a run in Europe, eliminating Feyenoord, Linfield and IFK Göteborg to reach the semi-finals of the European Cup, where they were knocked out by Liverpool. In 1987–88, they made it also to the quarter-finals of the UEFA Cup, eliminating Juventus, Auxerre and Budapest Honvéd. Dimitris Saravakos was top scorer of the competition. The 1990s were an even more successful period for the club, both nationally and internationally. Four Greek championships (1990, 1991, 1995, 1996), four Greek Cups (1991, 1993, 1994, 1995) and two Greek Super Cups (1993, 1994) were awarded to the club. In the 1991–92 season, Panathinaikos reached also the last eight of the European Cup and took part in the first ever European tournament to have a group stage. In 1995–96, with Juan Ramon Rocha as coach and key players Krzysztof Warzycha, Józef Wandzik, Stratos Apostolakis, Georgios Georgiadis, Dimitris Markos, Giannis Kalitzakis, Giorgos Donis and Juan Jose Borrelli, Panathinaikos reached the Champions League semi-finals, finishing first in the group stage against Nantes, Porto, Aalborg BK and eliminating Legia Warsaw in the quarter-finals. In the semi-finals, Panathinaikos faced Ajax, recording an impressive 0–1 first leg away victory with Krzysztof Warzycha scoring the winning goal. Ajax had a record of 22 undefeated international matches until then, with Panathinaikos breaking their series. The Greek team, however, suffered a 0–3 defeat on the second leg. Thus, Panathinaikos was denied entry to a Champions League final once more. Giorgos Karagounis, captain of Panathinaikos and the Greek national team. In the summer of 2000, President Giorgos Vardinogiannis resigned from his duties with complaints for the refereeing situation in Greece and passed his shares to his nephew Giannis Vardinogiannis, who changed the style of the club's management. Angelos Anastasiadis was initially appointed coach of the team and later the ex-player Giannis Kyrastas. With the arrival of coach Sergio Markarian, Panathinaikos reached the quarter-finals of the 2001–02 UEFA Champions League, being eliminated by Barcelona. Panathinaikos had passed the first group stage as the top club against Arsenal, Mallorca and Schalke 04, and the second group stage as second against Real Madrid, Porto and Sparta Prague. In the first leg of the quarter-finals, Panathinaikos managed to defeat Barcelona by 1–0 in Apostolos Nikolaidis Stadium. The second leg in Camp Nou was to be an eventful one. Panathinaikos scored first thanks to a beautiful goal by Michalis Konstantinou and had immediately after, an amazing chance to double their goals. Although, Barcelona scored three goals, Panathinaikos didn't give up, but were unlucky. Three unique and great chances by Konstantinou, Olisadebe and Vlaović were missed. Especially, the last one, by Vlaović, happened during the last seconds of the injury time, with the reactions and disappointment of Panathinaikos' players and the big relief of Barcelona fans being characteristic. It has to be noted that Panathinaikos performance in Camp Nou was so great, that forced the Catalan fans to boo their own team during the match. Ιn Europe, Panathinaikos made it to the quarter-finals of UEFA Cup quarter-finals. En route, the Greek team had knocked-out Litex Lovech, Fenerbahçe (with an impressive 4–1 win in Apostolos Nikolaidis Stadium), Slovan Liberec and Anderlecht. During the quarter-finals, although winning the first match in Estádio das Antas against eventual winners of the trophy FC Porto of José Mourinho, with the header of Emmanuel Olisadebe, they were eliminated after extra time. Notable players of this team included Takis Fyssas, Giorgos Karagounis, Antonis Nikopolidis, Angelos Basinas, Nikos Lyberopoulos, Michalis Konstantinou, Giourkas Seitaridis, Sotirios Kyrgiakos, Paulo Sousa, Goran Vlaović, Rene Henriksen, Joonas Kolkka, Jan Michaelsen and Emmanuel Olisadebe, considered by the fans one of the best teams in the club's history. During 2002–03 Alpha Ethniki season, they lost the Greek championship in the last two games by arch-rivals Olympiacos. Under the guidance of Israeli coach Itzhak Shum, Panathinaikos managed to win the championship in 2004. They won also the Cup, beating Olympiacos 3–1 in the final, making the double. New players like Ezequiel González, Lucian Sanmartean and Markus Münch had signed the summer before. In the Champions League, they came third in the group stage facing Manchester United, VfB Stuttgart and Rangers. However, Shum was unexpectedly fired early in the next season (2004–05) and Zdeněk Ščasný succeeded him on the bench. Panathinaikos finished second in the championship, while in the Champions League they came again third in the group stage facing Rosenborg, PSV and Arsenal. They continued in the UEFA Cup, where they were eliminated by Sevilla. In 2005, major changes were made in the team's roster. Players like Angelos Basinas and Michalis Konstantinou departed, while others like Flávio Conceição, Igor Bišćan and Andreas Ivanschitz arrived. Ščasný gave his seat to Alberto Malesani. At the start of the 2006–07 season, Malesani left the team and was replaced by Hans Backe, who left only three months after his appointment; Víctor Muñoz was his replacement. For the 2007–08 season, Panathinaikos hired José Peseiro. On 22 April 2008, and under pressure from the fan base, main shareholder Giannis Vardinogiannis gave a press conference in which he announced the decision of his family to reduce their share in the club to 50%—after 30 years of full ownership—through a €80 million increase of the company's capital stock. After the negotiations and the share capital increase, the Vardinogiannis family would hold 56% of the club, the amateur Club 10% and the other shareholders 34% (with main investors Andreas Vgenopoulos, Pavlos Giannakopoulos, Adamantios Polemis and Nikos Pateras). Nikos Pateras was selected to be the new president of the club. Following the major changes in 2008, Panathinaikos hired Henk ten Cate as coach and bought many expensive players, such as Gilberto Silva from Arsenal and Gabriel from Fluminense. In the 2008–09 season, the Greens proved that they could hold their weight in the Champions League by reaching the last 16. However, they disappointed in the Greek Championship, finishing third in the regular season, though they managed to come second overall after the playoff mini-league. The 2009–10 season was a successful one for Panathinaikos. During the summer transfer period, the club bought Djibril Cissé from Marseille, Kostas Katsouranis from Benfica, Sebastián Leto from Liverpool and various other players, spending more than €35 million in total. Henk ten Cate left in December to be replaced by Nikos Nioplias. The team managed to reach the last 16 of the Europa League, eliminating A.S. Roma after two amazing matches in Olympic Stadium of Athens and Stadio Olimpico. Panathinaikos also won both the Greek Championship and the Greek Cup, beating Aris by 1–0 in the final of the latter, thanks to a goal by Sebastián Leto. In 2011, due to financial problems and management disagreements, Panathinaikos sold Cissé for €5.8 million to Lazio and first-choice goalkeeper Alexandros Tzorvas to Palermo in order to reduce the budget. New players then entered, such as Quincy Owusu-Abeyie, Toché, Vitolo and Zeca. The club also changed their president and chose Dimitris Gontikas to be the new chairman. Panathinaikos failed to qualify to the group stage of 2011–12 Champions League after they were knocked out by Odense BK 4–5 on aggregate. Panathinaikos' downfall continued as a result of the serious riots in the Panathinaikos–Olympiacos derby of 18 March 2012. The entire board quit and Panathinaikos remained headless for about two months. However, the owner of Skai TV, Giannis Alafouzos, devised a plan to take Vardinogiannis' shares (54.7%) and make them available to fans around Greece so that everyone could contribute a desired amount, so that Panathinaikos could overcome the crisis. His plan seemed to be working, as a new 20-member board was elected with Dimitris Gontikas at the president's chair again, though it was yet to be seen how the fans would respond to Panathinaikos' call for help. On 2 July 2012, the PAO Alliance 2012 finally opened to the public so that everyone could be a member and contribute a desired amount in return for privileges. After a few weeks of operation, 8,606 members had signed up, some of which were current or former Panathinaikos players, including Jean-Alain Boumsong, Sotiris Ninis, Gilberto Silva and Djibril Cissé, among others. On 18 July 2012, marked a historical day in Panathinaikos history, as Giannis Vardinogiannis gave his shares—54.7% of Panathinaikos—to the Panathinaikos Alliance, thereby allowing Panathinaikos to have a fresh start with their own fans at the steering wheel, who through elections (amongst the members of the Alliance) they compose the Board of Directors and elect the club's president. The first president elected was Giannis Alafouzos. The first season with the Panathinaikos Alliance at the helm was nothing short of abysmal for the club. While still enduring financial troubles, Panathinaikos finished sixth in the championship and failed to qualify for the European competition for the first time in 16 years. For the 2013–14 season, the membership had risen up to 9,305 members. Starting the football year, both fans and journalists were very skeptical of Panathinaikos' chances of a successful season, and many people expected the team to suffer relegation from the Superleague Greece. In May 2013, Yannis Anastasiou was appointed manager, and he planned a team based on players from the Panathinaikos Youth Academies joined by experienced foreign players looking to revive their careers. Despite the early skepticism, Panathinaikos' fans supported the team through the rough start, and the season turned out to be a massive success in light of the dire financial situation of the club and the young and inexperienced squad. The club finished fourth in the regular season and second after the playoffs (meaning they qualified for the 2014–15 Champions League), with Marcus Berg the top scorer of the team. Panathinaikos also won the 2013–14 Greek Football Cup after a 4–1 win over PAOK. On 2 November 2015, after bad performances and a home draw with AEK Athens, manager Yannis Anastasiou was sacked and replaced by Andrea Stramaccioni. Further successive poor results under the latter's reign, combined with loss of dressing room control, led to the dismissal of Stramaccioni on 1 December 2016, with former Panathinaikos player and Greece international Marinos Ouzounidis taking over the management at the club. White was the colour that was first used by the team in 1908 (probably like that of the first crest). The first symbol of the club was an association football ball of the era. In 1911, the colours changed to green and white. In 1918, Michalis Papazoglou proposed the trifolium, symbol of harmony, unity, nature and good luck, as emblem of Panathinaikos. The officials of the club were looking for a universal, non-nationalistic or localistic, symbol aiming to represent the whole Athens at the country and further at the world. Papazoglou used to have it sewn on his shirt since he was competing for a club in his native Chalcedon, Constantinople (present-day Istanbul, Turkey). He was possibly inspired by Billy Sherring, an Irish Canadian athlete who had won the Athens 1906 Olympic marathon (1906 Intercalated Games) wearing a white outfit with a big green shamrock on the chest. Georgios Chatzopoulos, member—and later president—of the club and director of the National Gallery, took over to design the new emblem for the team. Up to the end of the 1970s, a trifolium (green or white) was sewed on heart's side of the jersey and was big in size. With the beginning of professionalism, the crest of the F.C. was created, accompanied by the club initials and the year of founding, 1908. Until today, the team's traditional colours are green and white (green for health, nature, such as physiolatry, and white for virtue), although the white sometimes is omitted, used as trim or as an alternative. During the first years after the establishment of green as Panathinaikos' primary colour, players were wearing green shirts, white shorts and green socks. During the 1930s, an appearance with characteristic horizontal strips was established. This motive was used also in the next decades as primary or second choice. Since then, the uniform style has changed many times, but green has always remained the team's primary colour. Panathinaikos' traditional home ground since the early 1920s is the Apostolos Nikolaidis Stadium, the oldest active football stadium in Greece, in the Ampelokipoi district of central Athens. The stadium is located on Alexandras Avenue and is most commonly referred to as Leoforos (Greek for "Avenue"). It is considered one of the most historic stadiums in Greece, as it was used by the Greek national team as home ground for many years (most recently for the UEFA Euro 2004 qualifying matches) and even by Panathinaikos' biggest rivals, AEK Athens and Olympiacos, on various occasions. Panathinaikos left Leoforos in 1984 to play in the newly-built Athens Olympic Stadium. In 2000, then-club president Angelos Filippidis announced a return to the Apostolos Nikolaidis Stadium, following a €7 million renovation. Capacity was reduced from 25,000 to 16,620, new dressing rooms were built and modular stand roofing was added in compliance with UEFA requirements, but in 2004, stricter standards were announced and the Apostolos Nikolaidis Stadium would need further expansion were it to remain suitable for UEFA-sanctioned matches. This was precluded by local zoning regulations and the team had to return to the Olympic Stadium once more until a new stadium, the proposed Votanikos Arena, was built. The Leoforos ground was due for demolition. 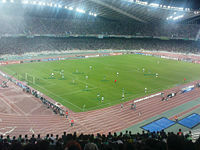 On 27 January 2007, the board of Panathinaikos decided to reuse the Apostolos Nikolaidis Stadium for the team's 2007–08 domestic league and UEFA Cup home games. Additionally, the club officials decided to install new lawn, new seats and upgrade the press conference room and the restrooms. As of October 2013, and due to the club's and the country's financial troubles, the construction of the Votanikos Arena has stopped and consequently the plans for the demolition of the Apostolos Nikolaidis Stadium have been put on hold. After another five-year spell at the Olympic Stadium, the team has returned to its traditional home ground once again. The current president of the club, Giannis Alafouzos, declared his intention for another renovation of the stadium and the capacity increase, while the Panathinaikos Movement made its propositions for a total reconstruction. Paiania has been the training ground of Panathinaikos since 1981. That same year, the Academy of the club was reorganized, becoming one of the best in the country and feeding the first team with notable players, such as Giorgos Karagounis, Angelos Basinas, Sotirios Kyrgiakos and Sotiris Ninis among others, key members of the Greek national team. In 2013, was decided the move of the club from the previous training center of Paiania to a new one, owned by the team. Located in the area of Koropi, Georgios Kalafatis Sports Center became a new training ground and Academy base of Panathinaikos. Until 1979, football in Greece was still in amateur level. The team, such as the other departments of Panathinaikos A.O., depended on the financial support of the club's members, while the president (responsible for all athletic departments) was elected by the Board members. In 1979, the Greek football turned professional and the Vardinogiannis family purchased the football department. Giorgos Vardinogiannis became the new president. Vardinogiannis family were the owners of the club the next decades. On 22 April 2008, and under pressure from the fan base, main shareholder Giannis Vardinogiannis gave a press conference in which he announced the decision of his family to reduce their share in the club to 50%—after 30 years of full ownership—through a €80 million increase of the company's capital stock. After the negotiations and the share capital increase, the Vardinogiannis family would hold 56% of the club, the amateur Club 10% (as before) and the new shareholders 34%. Pavlos Giannakopoulos, Nikos Pateras, Adamantios Polemis and Andreas Vgenopoulos were the main investors, plus other minor shareholders. Nikos Pateras was selected to be the new president. In 2011, due to financial problems and management disagreements, the direction decided to reduce the budget and sell many players. In 2012, the owner of Skai TV, Giannis Alafouzos, devised a plan to take Vardinogiannis' shares (54.7%) and make them available to fans around Greece so that everyone could contribute, so that Panathinaikos could overcome the crisis. His intention was to create a new, for the Greek athletic standards, supporter-owned football club. On 2 July 2012, the Panathenaic Alliance finally opened to the public so that everyone could be a member and contribute a desired amount in return for privileges. A few days later, Giannis Vardinogiannis gave his shares—54.7% of Panathinaikos—to the Alliance, while the other shareholders maintained their percentage. The members of the Alliance through elections compose the Board of Directors and elect the club's president. The first president elected was Giannis Alafouzos. In 2013, was decided the move of the team from the previous training center of Paiania to a new one, owned by the club. Located in the area of Koropi, Georgios Kalafatis Sports Center became the new training ground and academy base of Panathinaikos. For the 2014–15 season, the membership had risen up to 8,495 members contributing a total of €2,680,041. Panathinaikos currently is partially supporter-owned football club. According to the latest accounts in 2016 Panathenaic Alliance shares have been reduced to (15%), Giannis Alafouzos through Sortivo International Ltd and his own shares is the largest shareholder at (74%). Giannis Alafouzos suddenly decided to quit the team in September 2017, announcing his departure in a written statement and inviting potential investors to express their interest in buying the team. Panathinaikos was founded by middle class athletes (with Giorgos Kalafatis as a key figure) aiming of spreading and making more known football to the Athenian and Greek public in general. Also, their intention was to create a team for all of Athens and to be connected with the rest of the European football movement, which was already active. Today, according to UEFA and numerous polls and researches by the biggest newspapers and poll companies in a span of 20 years, Panathinaikos is the second most popular football team in Greece, with the difference behind Olympiacos to be varied between 2% to 9% and the difference in front of the third to be fluctuated between 17% to 21% among the fans. They have the highest popularity in Athens metropolitan area according to many of the corresponding polls, having also a large fanbase in all Greek prefectures, in Cyprus and in the Greek diaspora. They have a large fanbase among high-educated people and the Greek upper class (traditionally representing the old Athenian society), while they are popular among the middle and lower classes also. Panathinaikos supporters hold both records of the most season tickets sales (31,091 in 2010) and highest average attendance for a unique season (44,942 in 1985–86) in the history of Greek football. The main organized supporters of Panathinaikos are known as Gate 13 (established 1966), the oldest fan association in Greece, which consists of around 80 clubs alongside Greece and Cyprus. Gate 13 style of supporting includes the use of green fireworks, large and small green flags, displaying of banners and especially the creation of colorful and large choreographies, noisy and constant cheering and other supporters stuff. Gate 13 has over the years become a part of the club by affecting club decisions and by following the club on all occasions. They share close relations with Ultras Rapid Wien, as well as A.S. Roma fans. They are also allies with Dinamo Zagreb's Bad Blue Boys and Orgullo Vikingo of Real Madrid. PALEFIP (Panhellenic club of Panathinaikos friends) is another supporters organization. Panathenaic Alliance, a collective organisation of the fan base, is the major shareholder of the football club, making it currently the only supporter-owned football club in Greece. The members of the Alliance, through elections, compose the Board of Directors and elect the club's president. Panathinaikos Movement, founded in 2012, is also a Greek political party founded by people with an initial common their love for the sports club of Panathinaikos and the wish for a new stadium for the football team, despite the bureaucracy of the Greek state. Mimis Domazos holds the record for Panathinaikos appearances, having played 502 first-team matches between 1959 and 1980. Striker Krzysztof Warzycha comes second, having played 390 times. The record for a goalkeeper is held by Takis Ikonomopoulos, with 303 appearances. Krzysztof Warzycha is the club's top goalscorer with 288 goals in all competitions between 1989 and 2004, having surpassed Antonis Antoniadis' total of 180 in January 1998. Panathinaikos record home attendance is 74,493, for a Greek League match against AEK Athens in 1986 at the Olympic Stadium. The record attendance for a Panathinaikos match at the Apostolos Nikolaidis Stadium is from 1967, when 29,665 spectators watched the Cup Winners' Cup game between Panathinaikos and Bayern Munich. Panathinaikos is the only club in the history of Greek football to finish a top-flight (after 1959) campaign unbeaten. This happened in the 1963–64 season. 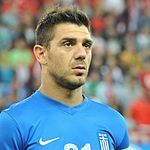 Overall, Panathinaikos has a significant contribution to the Greek national football team. Giorgos Kalafatis, the founder of Panathinaikos, was the elector and member of the Greek national team that participated in the Inter-Allied Games in Paris, while later he was also a player/manager for Greece in the 1920 Olympic Games in Antwerp. During the next decades, Panathinaikos highlighted some of the best Greek players in the history of Greek football, who contributed also to the national team (Migiakis, Linoxilakis, Loukanidis, Domazos, Antoniadis, Kapsis, Ikonomopoulos, Saravakos etc.). Six Panathinaikos players were members of the first appearance of the national team in a World Cup in 1994 (Saravakos, Kolitsidakis, Apostolakis, Kalitzakis, Nioplias, Marangos). Six players of the club were part of the golden team of 2004 that won the UEFA Euro 2004. UEFA Euro 2004 (6): Giourkas Seitaridis, Antonis Nikopolidis, Kostas Chalkias, Angelos Basinas, Giannis Goumas, Dimitris Papadopoulos. ^ "Στο 44,24% οι ονομαστικές μετοχές του Γιάννη Αλαφούζου". Gazzetta.gr. Retrieved 24 February 2019. ^ Οκτ. 2018 09:43, Δημοσίευση: 09. "Μπήκε στον Παναθηναϊκό ο Παϊρότζ!". Sport24.gr. Retrieved 24 February 2019. ^ Οκτ. 2018 11:21, Επιμέλεια: sport24 radio Δημοσίευση: 09. "Παναθηναϊκός: Ο Αλαφούζος κάνει προσωπικές τις μετοχές της Sortivo". Sport24.gr. Retrieved 24 February 2019. ^ "Tέλος ο Κωνσταντίνου, νέος πρόεδρος ο Μαυροκουκουλάκης!". www.gazzetta.gr. ^ "ΠΑΝΑΘΗΝΑΪΚΟΣ Α.Ο." Panathinaikos1908.gr (in Greek). Retrieved 26 June 2015. ^ "Η ίδρυση και οι μεταμορφώσεις του Παναθηναϊκού". Sansimera.gr (in Greek). Retrieved 26 June 2015. 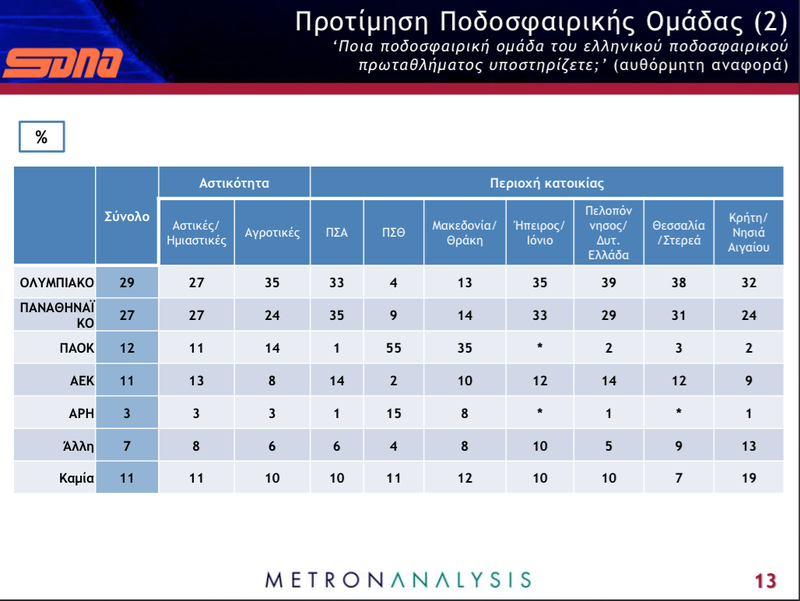 ^ "Concentration of people supporting the most popular club (page 41), Greece: Olympiacos 26%" (pdf). UEFA sixth club licensing benchmarking report on European club football. UEFA. 17 April 2014. Retrieved 20 April 2014. ^ a b "Ο οπαδικός χάρτης της Ελλάδας!". Sdna.gr. Retrieved 26 June 2015. ^ "Greece Eternal Thespians". Fifa.com. Archived from the original on 20 March 2013. Retrieved 26 November 2009. ^ "Top 10 club rivalries - Olympiakos v Panathinaikos". Goal.com. Retrieved 24 February 2019. ^ "The 25 biggest club rivalries in world football - where does Real Madrid vs Atletico rank?". Telegraph.co.uk. 26 May 2016. Retrieved 24 February 2019. ^ "Rivals: Olympiakos vs Panathinaikos - Derby of the Eternal Enemies". Outsideoftheboot.com. 27 April 2017. Retrieved 24 February 2019. ^ House, Future Publishing Limited Quay; Ambury, The; Engl, Bath BA1 1UA All rights reserved; number 2008885, Wales company registration (5 March 2014). "Flares, fighting and fear: Why Olympiakos vs Panathinaikos is Europe's maddest derby". FourFourTwo.com. Retrieved 24 February 2019. ^ "Football First 11: Do or die derbies". CNN. 22 October 2008. Retrieved 23 October 2008. ^ Neil Johnston (22 October 2014). "Olympiakos-Panathinaikos: Europe's maddest derby?". BBC Sport. Retrieved 22 October 2014. ^ a b c d e "History". Pao.gr. Archived from the original on 29 December 2015. Retrieved 23 June 2011. ^ a b c d "103 χρόνια από την ίδρυση του Παναθηναϊκού (At this day, Panathinaikos was founded 103 years ago)". To Vima (in Greek). 3 February 2011. ^ a b c d e Kyriazis, Christos (4 February 2008). "The Golden Age of PAO". Ethnosport (in Greek). Pegasus Publishing S.A. Archived from the original on 21 April 2008. Retrieved 28 March 2008. ^ Alexopoulos, Ilias (3 January 2008). "Our best moments..." Athlitikι (in Greek). Archived from the original on 5 October 2009. ^ Παναθηναϊκός - Ολυμπιακός 8-2. E-soccer.gr (in Greek). ^ Football during the War. Xyzcontagion.wordpress.com (in Greek). ^ History of PAO. Palaimaxoipao1908.blogspot.gr (in Greek). ^ Το έπος του Γουέμπλεϊ. E-soccer.gr (in Greek). ^ "Intercontinental Cup 1971". FIFA. 10 December 2008. Archived from the original on 25 June 2012. ^ "Balkan Cup 1970-79". Rec.Sport.Soccer Statistics Foundation. Retrieved 24 April 2012. ^ "Cissé signing adds to Lazio's attacking options". Uefa.com. 12 July 2011. ^ Skokas, Giannis (26 August 2011). ""Σικελός" ο διεθνής γκολκίπερ Αλέξης Τζόρβας (Alexis Tzorvas a "Sicilian")" (in Greek). To Vima. ^ ""Εξαντλήσαμε τα περιθώρια", είπε ο Γόντικας για την ομαδική παραίτηση ("No tolerance anymore" said Gontikas after mass resignation)". In.gr (in Greek). Athens. 23 March 2012. ^ a b "Ετοιμο το πλάνο Αλαφούζου που "δεν έχει πολυτέλεια για διχόνοιες" (Alafouzos' plan is ready)". In.gr (in Greek). Athens. 30 April 2012. ^ ""Έχουμε πολλά θέματα και λίγο χρόνο" δήλωσε ο Γόντικας (Gontikas: "We have many issues and little time")". In.gr (in Greek). Athens. 9 May 2012. ^ "1908–1920". Leoforos.gr (in Greek). Archived from the original on 20 November 2014. Retrieved 23 June 2011. ^ "Η δεκαετία του 1920 και η εμφάνιση νέων αθλητικών σωματείων". Paoabroad.com. Retrieved 18 November 2017. ^ a b "Trifylli". Pao.gr. Archived from the original on 26 July 2015. ^ "Five claims to fame: Panathinaikos". uefa.com. ^ "Παναθηναϊκός 106 ετών (vids)!" (in Greek). gazzetta.gr. ^ "Αποθέωση του Τριφυλλιού στο «Στάδιο», δύο χρόνια πριν την ίδρυση του Παναθηναϊκού" (in Greek). palaimaxoipanathinaikou.gr. ^ "Αύξησε τις προσωπικές μετοχές ο Αλαφούζος". Sport24.gr (in Greek). Retrieved 14 December 2016. ^ ""Gate 13" is born". Pao.gr. Retrieved 26 October 2016. ^ "Επαρχία - Gate 13 – 1966". Gate13.gr. Retrieved 26 June 2015. ^ Βrothers. Gate13.gr (in Greek). ^ Enrico Gregori (11 November 2012). "Allarme derby, infiltrati tra i tifosi ci sono anche gli ultrà greci". Il Messaggero. Retrieved 16 February 2013. ^ Σιούτας, Θοδωρής (27 September 2015). "Συμπαράσταση στους Ultras της Ρομα! (pic)". Leoforos.gr. Retrieved 18 November 2017. ^ "Zajec, Dražen i borba da se nogomet vrati navijačima: Što veže Boyse i Gate 13 (Croatian)". Index.hr. Retrieved 16 January 2019. ^ "ΠΑ.ΛΕ.ΦΙ.Π." Palefip.gr. Retrieved 18 November 2017. ^ Ο "στρατηγός" του Παναθηναϊκού και της Εθνικής. Sport-fm.gr (in Greek). ^ Οι κορυφαίοι σε συμμετοχές. Express.gr (in Greek). Archived from the original on 22 March 2012. ^ Συμμετοχές. Sentragoal.gr (in Greek). Archived from the original on 28 July 2011. ^ Βαζέχα: η πράσινη σημαία. Contra.gr (in Greek). ^ Τα ρεκόρ του Βαζέχα. Sday.gr (in Greek). Archived from the original on 22 May 2011. ^ Όπου και αν παίζεις μαζί σου ΠΑΟ. Leoforos.gr (in Greek). ^ Γήπεδο Λεωφόρου Αλεξάνδρας. Leoforos.gr (in Greek). Archived from the original on 27 December 2013. ^ Τα χρόνια της "πράσινης" υπεροχής 1960–1970. Pao.gr (in Greek). Archived from the original on 22 December 2015. ^ Οι Πρωταθλητές Ελλάδας από το 1928 μέχρι σήμερα (in Greek). Hellenic Football Federation epo.gr. ^ Kárpáti, Tamás; Schöggl, Hans. "List of Greece championships". RSSSF. Retrieved 12 April 2012. ^ a b "Trophy Room". Pao.gr. Archived from the original on 19 January 2016. Retrieved 12 April 2012. ^ "Greece – List of Cup Winners". Rsssf.com. ^ "Greece - List of Super Cup and League Cup Finals". RSSSF. ^ "Cruyff pulls the strings". Union of European Football Associations (UEFA). Archived from the original on 13 December 2011. ^ Ionescu, Romeo; Stokkermans Karel. "Balkan Cup". RSSSF. ^ Magnani, Loris; Stokkermans Karel. "Intercontinental Club Cup". RSSSF. ^ "Greece - Final Tables 1906-1959". Rsssf.com. Retrieved 18 November 2017. ^ Mastrogiannopoulos, Alexander. "Greek final tables 1906–1960". RSSSF. Retrieved 12 April 2012. ^ "Squad". Pao.gr. Retrieved 29 August 2017. Wikimedia Commons has media related to Panathinaikos FC.